Smart Mirror glass and acrylic provides superior transparency to a standard two way mirror, allowing crisp text and graphics to be displayed through the mirror. 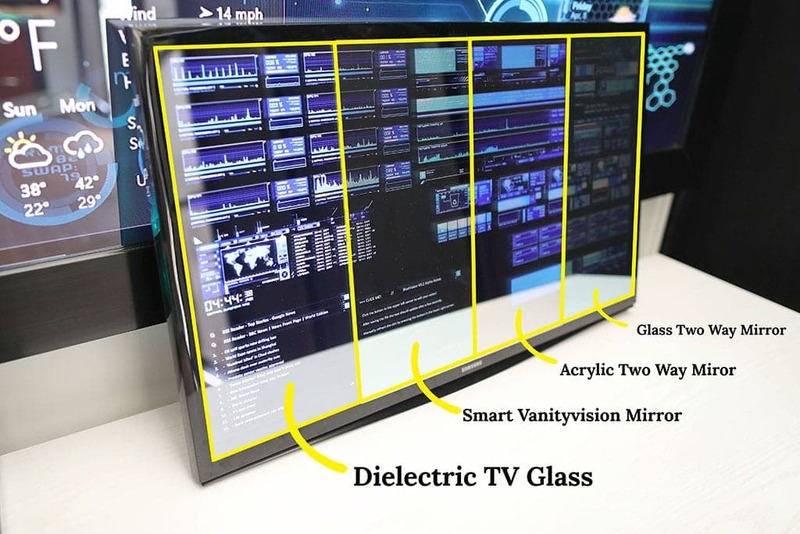 A smart mirror, also known as a magic mirror, consists of a transparent mirror and a screen behind the mirror. It shows important updates so the words appear to be floating on the reflection of the mirror. Updates can include the weather, calendar events, news, and social media notifications. To show that information, a display must go behind the mirror. This can be a TV, computer screen, or tablet. Framed and frameless styles are both popular, depending on the style of the living space. Our specialty is offering very transparent glass and acrylic smart mirrors. They provide a crystal clear view of the text and graphics compared to a standard Glass Two Way Mirror. For your convenience, we provide smart mirror apps free of charge for Raspberry Pi, Windows PC, and Android. We offer easy to follow guides further down on this page. They explain all the details of how to put everything together. What is the Use of a Smart Mirror? 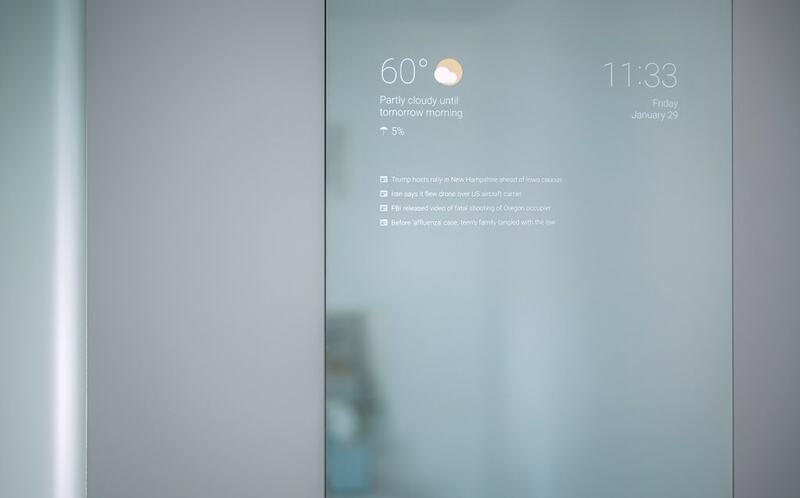 A Smart Mirror is the latest in high tech home decor. It is a custom mirror installation that is both a mirror and display. It takes data from the internet including: time, weather, stock reports, quotes and more to keep you up to date. The Glass Smart Mirror in 13/64″ thickness has a reflection that is identical to a standard mirror and it is more transparent than the Glass Two Way Mirror. This means that for TV Mirror projects (typically in the bathroom) will not need to buy matching mirrors – you can use regular Standard Mirrors for the other mirrors in the room and there will be no visible difference. We offer samples of our product so you can see it in person in the comfort of your own home. The 6mm thickness is the latest and greatest so it will be extremely color neutral. The 3mm thickness has more of a warm tone to it. Tempering is available if needed – we do not recommend it unless it is being installed as a table, door, or you are worried about breakage. Beveling is also more of a decorative option if you already have beveled mirrors in your home. 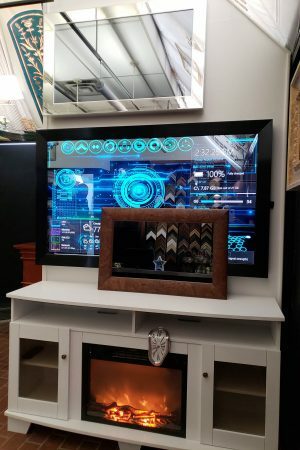 Purchasing the mirror by itself makes your smart mirror project affordable. For a limited time, we are offering special pricing for popular sizes. 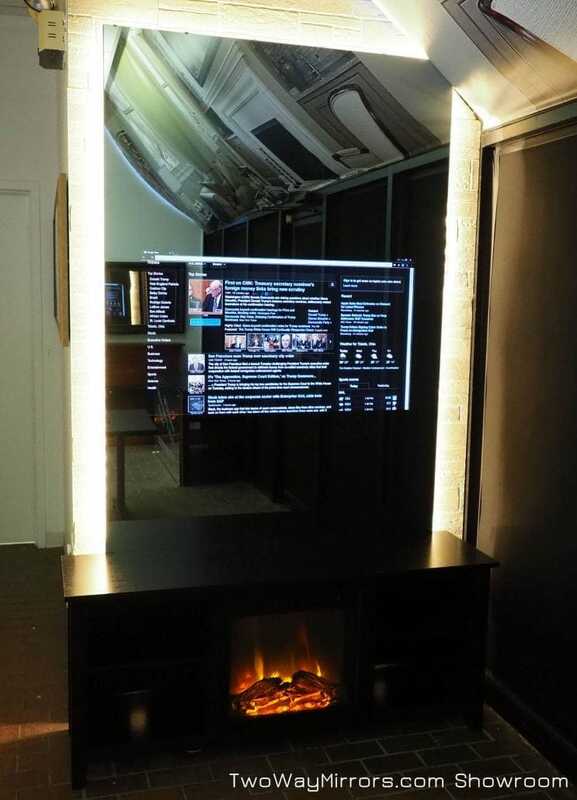 Combine our mirror with a screen and computer system to display the text through the mirror. 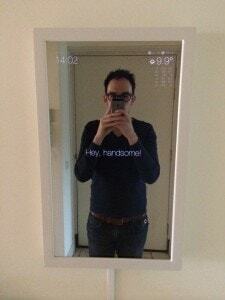 We now offer custom framework to fit your Smart Mirror. If you have no woodworking skills, this is the perfect fit for you! We know there is a ton to hide behind that mirror. The frame needs to be thick enough to hold the mirror, monitor AND computer. Let’s face it, most premade frames are not that deep. You can order the standard 2.5″ thickness, or double it up to 5″ to fit even the most bulky display. I know, it is super daunting when you first think about doing a Magic Mirror project. To pull it off you need wood working skills, programming, glass cutting and assembly. We take all the hard work out of by setting up the Raspberry Pi for your magic mirror. You don’t have to worry about the software end of it. Plug it into your display and you’re all set with all the top programs such as clock, calendar, weather, news, and more! It is very easy to update! Check out the 3rd party modules on magicmirror.builders to add more functions to your mirror. 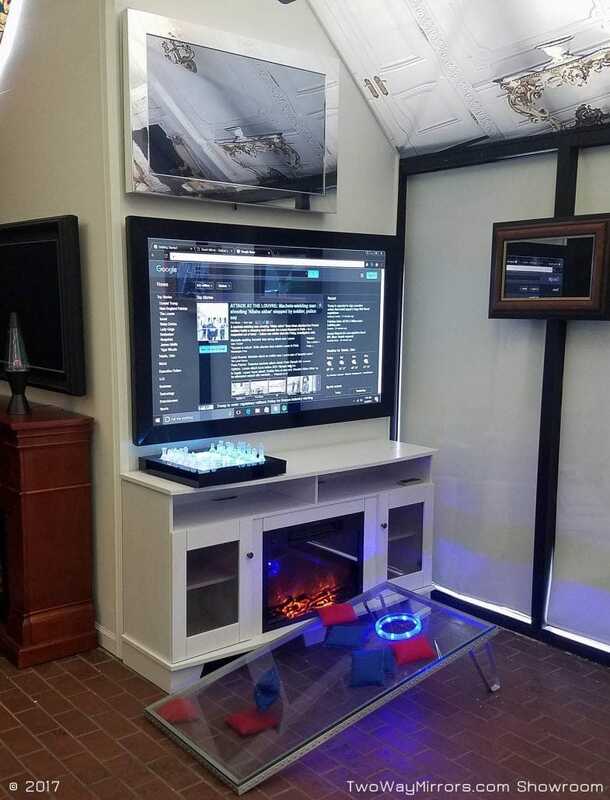 We have been building smart mirror and mirror television systems for 20 years. Every day we are perfecting our support, manufacturing, and packaging. We provide superior mirrors compared to our competition. The Smart Mirror products we sell have extensive documentation, specifications, demo videos, and a return policy. Our team is standing by to process your order right away. Cutting and packaging is usually done within a couple hours. If your glass requires tempering, please allow one week for manufacturing. To make sure PM2 can do it’s job when (re)booting your operating system, it needs to be started on boot. Luckily, PM2 has a handy helper for this. PM2 will now show you a command you have to execute. To use PM2 in combination with MagicMirror, we need to make a simple shell script. Preferable, we put this script outside the MagicMirror folder to make sure it won’t give us any issues if we want to upgrade the mirror. You’ll need to run in server only mode following the manual installation instructions. 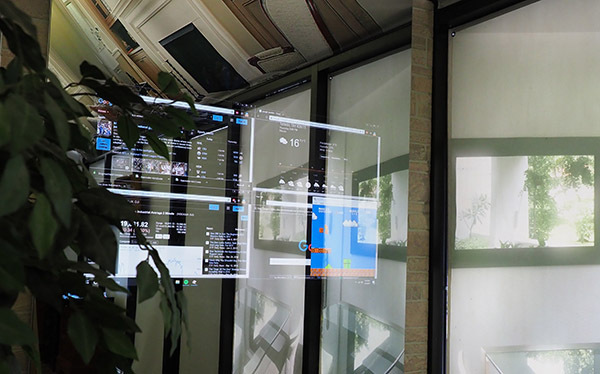 UCN Touch Foil offers inexpensive panels for Windows & Linux. IR Touch Systems (Huaxin Electronics) for Windows & Linux. Purchase them on Amazon and check out our Smart Mirror Touch Overlay instructions. You can save time and frustration by choosing the correct display for your touch overlay. You’ll need a non-touch display with a flat bezel. The bezel should be black, not silver or white. Avoid curved screens, as the overlay won’t be able to lay flat on them. Televisions with too small a bezel (under 0.5″) may pose a problem when laying the overlay on them, as there is nothing to set it on. The Rasberry Pi and Intel ComputeStick are very popular for the smart mirror projects. Smart Mirror development for the Pi has enjoyed the most attention in the media, so most people are using it. Windows 10 provides certain capabilities such hardware compatibility, expandability, gaming, and emulators. Android is a strong contender with its native support for Google Assistant speech recognition. 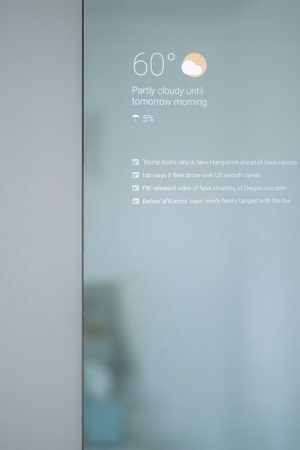 MangOS is a new Smart Mirror operating system with a lot of features. 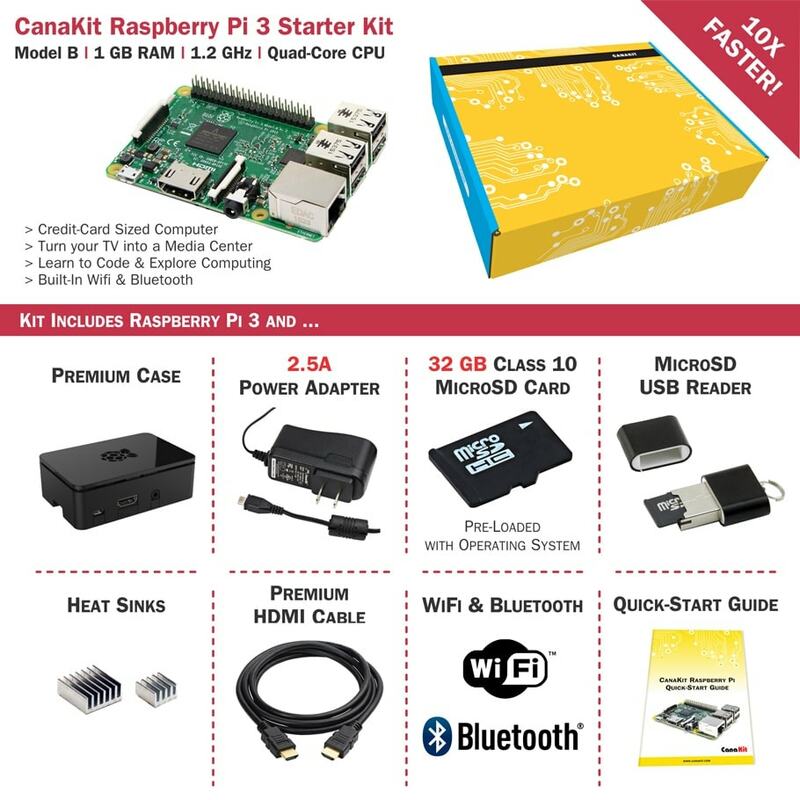 We love the appeal of the Raspberry Pi as well as the Intel ComputeStick. It all comes down to the OS you want to use, Linux vs Windows 10. You can use a monitor, tablet, or LED TV as your display–the thinner and brighter, the better. Samsung TabPro S or Galaxy Book – only 0.25″ thick, and allows gesture control, Cortana voice control, wireless mouse/keyboard/gamepad control. Add a touch capacitive film to the face of the glass for touch control. We recommend that you purchase the Samsung Multiport Adapter (EE-PW700BWEGUJ) to add 2 USB ports to your tablet. Samsung or LG ultra thin TV with PC or Raspberry Pi connected. Alternatively, add a ChromeCast and Google Assistant instead of the PC. You can use LED tape around the back edges, and have it radiate around the edges. Alternatively, light fixtures can be installed behind the mirror to shine straight through it. You can add a frosted effect with patterned window film, acid etching, or sandblasting. Signal strength is important, because the signal must usually pass through a TV/monitor screen and through the smart mirror glass. Bluetooth can be a nice feature, so that you don’t use an extra USB port for a USB keyboard receiver. We recommend the Logitech K830, which has a built in touchpad and offers both long range transmission using the included USB, as well as bluetooth if you don’t want to use the USB device. 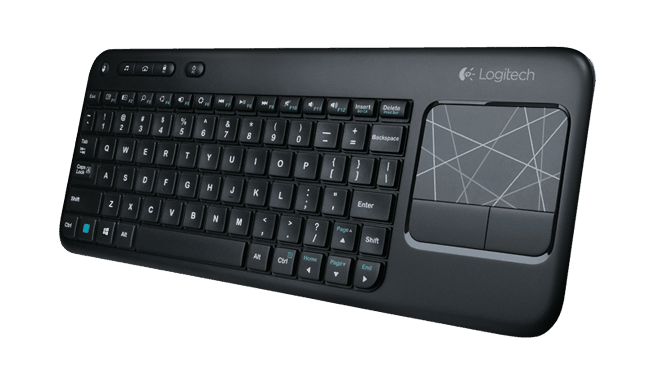 If you’re on a low budget, you we suggest a Logitech K400, which also has a great range, but a lower quality touchpad. IR passes through the mirror so you can still operate a remote. If you are back painting the backside, be sure to leave an unpainted area to keep line-of-sight available to the sensor. 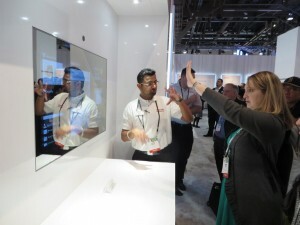 Gesture control works great, provided you have put a tablet PC behind the mirror. Alternatively, you could add a webcam to your setup to allow gesture control. Yes, many of our customers connect a Raspberry Pi or Intel ComputeStick to an Amazon Echo Dot, Google Home, or simply use Cortana to enable voice. Alternatively, you can use a phone or tablet with Google Assistant built in. Google has also released Google Now for Windows, which allows voice control over your Windows PC. 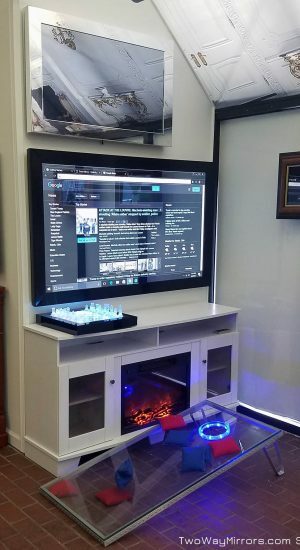 How we combined RetroPie with a smart mirror to make a travel gaming system. If you’re running Windows (recommended), MacOS, or Linux you can run Steam and any other games your OS supports. You’ll need a powerful CPU and graphics card to run many games, so a Microsoft Surface or Samsung TabPro S tablet is recommended if you’re looking for a thin device. Alternatively, use a Google ChromeCast to stream your PC to your smart mirror. Another advantage to running Windows is the vast array of keyboards, gamepads, and mice that provide additional control over your smart mirror. Connect a PS4 or Xbox using HDMI input wired back through the wall. Alternatively, use a streaming device such as ChromeCast to broadcast the stream through the mirror. Using GPemu, you can run emulator games from your Chrome browser in Android, Windows, or Linux. You can position cameras around the mirror from multiple angles. By setting up windows streaming the cameras, you can view yourself from all sides at once when looking at your reflection in the smart mirror. Yes, install a webcam behind the mirror at eye level, so when you read text you’re making eye contact with the camera. Two small displays should be located behind the mirror, one on each side of the webcam. Combine the displays into one using the display settings in Windows. If you have added touch capability to your smart mirror, we recommend cleaning your glass with an oleophobic coating to make sure you’re not smudging it with the oils on your fingers. In Android, simply long tap on your desktop and add the widget. In Windows, install Rainmeter and follow their instructions to create widgets using a text editor. If you are running the widgets in your Chrome browser, you can install the Simple Black theme to make it look better. You can turn the backround of websites to black by default using Dark Reader. Simple Black will change the browser itself to black. If you need to refresh content on the page, such as weather, sports scores, or stock reports, you can use the Chrome extension Super Auto Refresh. Use standard mirror clips or a j-channel to mount a mirror flush to the wall. You can paint the back (the non-mirror side–unless it’s beveled) with black spray paint such as Rust-Oleam High Heat or Ultra Cover 2x. Be sure to mask off the viewable area using a high quality blue painters tape such as Scotch Delicate Surface Masking Tape. Be sure to take careful measurements before painting to avoid mistakes, and you may consider purchasing a product sample from us for practice before painting the larger mirror. Alternatively, you can use Gila Black Privacy Window Film, and be sure to also buy their application kit. Assuming the mirror is being framed to connect it to the TV, you’ll want to use an ultra slim TV mount (0.4″ or less) behind it to keep it close to the wall. Alternatively, using an ultra thin tilting mount (0.75″ or less) will allow you to tilt it, connect cables or USB, then push it back against the wall when needed. Don’t forget to use anchors if you’re attaching it to plaster or drywall. A stud finder is recommended for mounting a TV wall mount, so you can drill into studs instead of drywall. 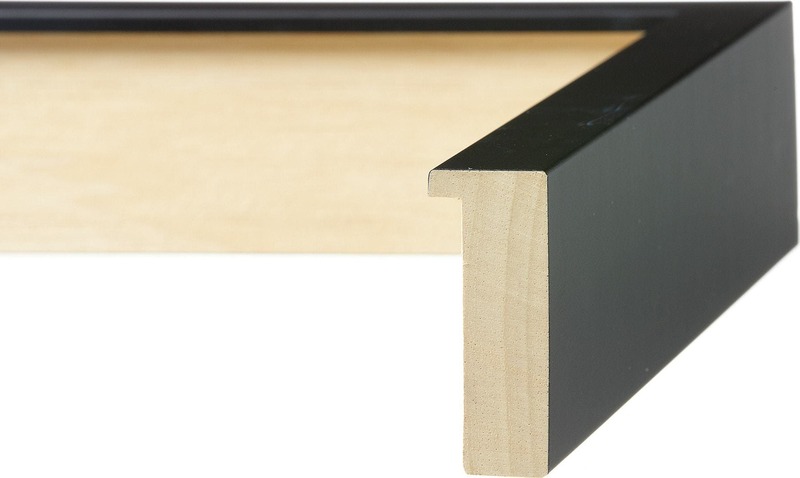 The Inland 05319 Ultra Slim Wall Mount is an excellent value at less than $20. 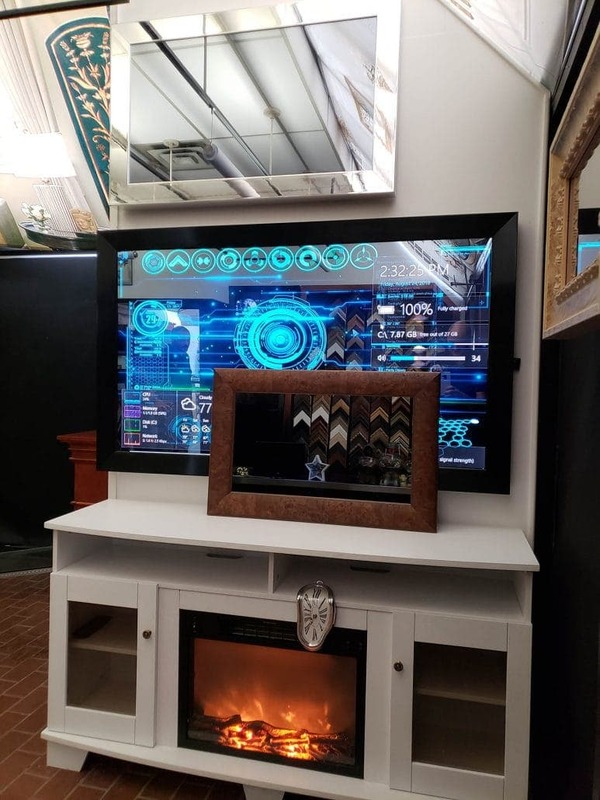 If the mirror is not being attached to the TV and it’s simply mounted in the wall, you can still use a wall mount within the wall, attached to a 2×4 board screwed into the studs. Take your frame sticks to a wood worker or use a router table to route out the frame to the correct size such as the Bosch RA1181 Benchtop Router Table. Sometime late last year I realized that I wanted my ordinary bathroom mirror to be more like the future we were promised in the movies. There doesn’t seem to be anyone selling the product I was looking for. The individual parts, however, were fairly easy to get. A number of people have done similar custom builds recently, but I had something different in mind. So I ordered myself a two-way mirror, a display panel and controller board, plus a bunch of components and arts & crafts supplies. M ichael Teeuw of Xonay Labs (pictured right) wasn’t expecting the rush of visits, compliments or questions when his latest invention blew up the DIY scene over 2 years ago. 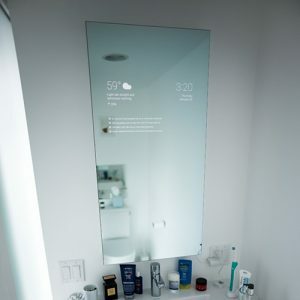 A magic smart mirror! Programmed to display and keep you updated with any information you need while adding a modern futuristic look to any room. It started with a monitor, casing/frame, installing Raspberry Pi and a smart mirror. All the instructions are easily accessible. Many people from all over the creative spectrum design their own spin on smart mirrors. Whether you use an old monitor, tablet, or TV you can make any flat technology into a useful piece of art. A living room mirror for movies, yoga and games, one in the kitchen for cooking and entertaining, and others in the bathroom for personal maintenance could one day give us the futuristic home we were promised decades ago. Yet, now that I’ve seen the technology in person, it still seems like a vision of the not-so-immediate future. If for some reason we have not answered your question above… check out this FAQ that can help you find what you need to know. What should I use to clean my Smart Mirror? One of the best features of our glass mirrors is that the mirror coating is extremely durable. You can clean it with standard glass cleaner and paper towels without worrying about scratches. The acrylic is a lot more prone to scratches, but no more so than regular acrylic. Novus 1 cleaner and Polish Mates are recommended to minimize abrasion and repair small scratches. Can I drill holes in this material? Yes, you can drill holes in non-tempered glass and acrylic. Please contact us for a price quote. Can you cut different shapes? We can cut glass to various sizes and shapes. We only sell acrylic in rectangles and squares, but is easy to cut or drill using standard tools. Please email us a drawing and we will quote it for you. Which is better, glass or acrylic? Glass is easy to clean, scratch resistant, and a flatter mirror. The acrylic, while susceptible to scratching, is lighter and safer. The acrylic is also bendy when you get above 24″ x 48″ in size. Please email us with the size and quantity you’re looking for and we will send a price quote and vendor application form. What size should I order the mirror? The great thing about the Glass Smart Mirror is that it is highly reflective, so you can do any mirror size and use a smaller display behind the mirror and it will vanish completely. In our most popular framing instructional guides, we are cutting the mirror to be the same size as the overall size of the TV. Which is better to use, a monitor or TV? If you’re making a small smart mirror, a tablet is often the best choice because it is thin and smart mirror apps are easy to find now. For a large smart mirror, it’s generally better to use a TV, preferably a thin TV. A TV typically has a flat backside and you can turn it on and off with a remote straight through the mirror. Can the mirror be larger than the display? Yes, if you’re not using a touch overlay. Simply back paint the backside with black paint everywhere except the TV and IR sensor. We recommend masking off the area with blue painters tape, and using a paint that works well on glass such as Black Rust-Oleum UltraCover 2x, which is available from your local Wal-Mart, Home Depot, Lowes, or Menards. What are the advantages/disadvantages of tempering? Tempered glass is heat-treated to increase the strength 10x. In addition, if tempered glass should break, it breaks into small shards which are less sharp than regular glass. The main disadvantage of tempered glass is that it causes distortion, similar to a fun-house mirror effect. For that reason, it’s generally not recommended unless going in a public installation. How close of a match is it to a standard mirror? The glass smart mirror has been formulated to match a standard mirror exactly when they are side by side. No longer do you need to order matching mirrors for the other mirrors in the room. A magic mirror is another way of saying smart mirror. It is a screen behind a semi-transparent mirror. You power it with a computer, raspberry pi, or tablet to make it look like the text is floating on the face of the glass.